The Space Telescope Science Institute (STScI) in Baltimore, Maryland, in conjunction with the University of Hawai’i Institute for Astronomy (IfA), is releasing the second edition of data from Pan-STARRS—the Panoramic Survey Telescope & Rapid Response System—the world’s largest digital sky survey. This second release contains over 1.6 petabytes of data (a petabyte is 1015 bytes or one million gigabytes), making it the largest volume of astronomical information ever released. The amount of imaging data is equivalent to two billion selfies, or 30,000 times the total text content of Wikipedia. The catalog data is 15 times the volume of the Library of Congress. 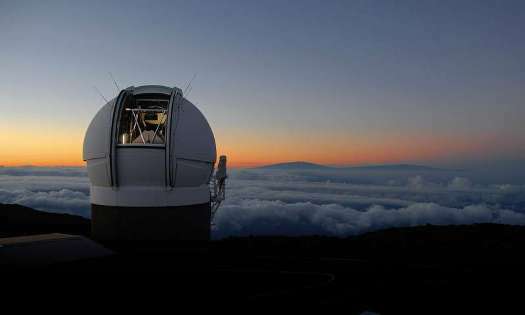 The Pan-STARRS observatory consists of a 1.8-meter telescope equipped with a 1.4-billion-pixel digital camera, located at the summit of Haleakalā, on Maui. Conceived and developed by the IfA, it embarked on a digital survey of the sky in visible and near-infrared light in May 2010. Pan-STARRS was the first survey to observe the entire sky visible from Hawai’i multiple times in many colors of light. One of the survey’s goals was to identify moving, transient, and variable objects, including asteroids that could potentially threaten the Earth. The survey took approximately four years to complete, scanning the sky 12 times in five filters. This second data release provides, for the first time, access to all of the individual exposures at each epoch of time. This will allow astronomers and public users of the archive to search the full survey for high-energy explosive events in the cosmos, discover moving objects in our own solar system, and explore the time domain of the universe. “We put the universe in a box and everyone can take a peek,” said database engineer Conrad Holmberg. The four years of data comprise 3 billion separate sources, including stars, galaxies, and various other objects. This research program was undertaken by the PS1 Science Consortium—a collaboration among 10 research institutions in four countries, with support from NASA and the National Science Foundation (NSF). Consortium observations for the sky survey were completed in April 2014. The initial Pan-STARRS public data release occurred in December 2016, but included only the combined data and not the individual exposures at each epoch of time. The Space Telescope Science Institute hosts the storage hardware, the computers that handle the database queries, and the user-friendly interfaces to access the data. The survey data resides in the Mikulski Archive for Space Telescopes (MAST), which serves as NASA’s repository for all of its optical and ultraviolet-light observations, some of which date to the early 1970s. It includes all of the observational data from such space astrophysics missions as Hubble, Kepler, GALEX, and a wide variety of other telescopes, as well as several all-sky surveys. Pan-STARRS marks the nineteenth mission to be archived in MAST.